So a few weekends ago, I failed at making a recipe. It happens. I attempted to make arepas. I guess the type of masa I had, was not the kind that would allow the arepas to puff up. Mine remained flat. Had I made them smaller, they would have been the perfect vehicle for which to serve something on. (I am a sucker for cute little appetizers!) This was a lot of work for a small tortilla size appetizer though. We ate it anyway, but that inspired me to make these little grit cakes (which my masa mess reminded me of). I had come across the grit cake recipe in Southern Living and wanted to try it out, but it’s silly really, to make these if you aren’t entertaining for a group. Well, I couldn’t wait for an event, so I decided that celebrating the Flyers was good enough….just me and my hockey-loving husband. I don’t think he thought that it was hockey-fare, but that’s ok. They were still good. I combined the grit cakes, oh excuse me, crostini, with a topping recipe from Gourmet Magazine that I have had forever and never tried. Glad I did! Preheat oven to 425. Sift together first 4 ingredients into a bowl. Whisk together milk and next 2 ingredients in another bowl. 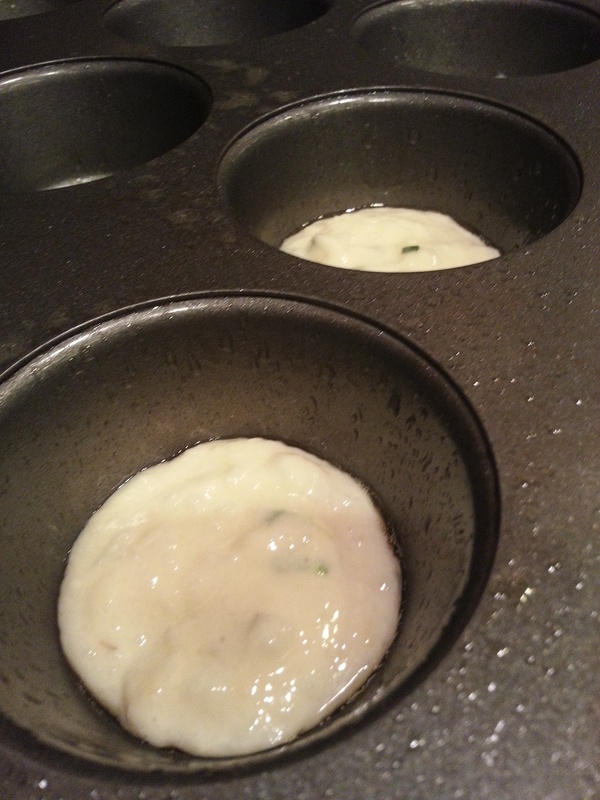 Add wet ingredients to flour mixture, stirring just until moistened. Whisk in grits, chives and cayenne. 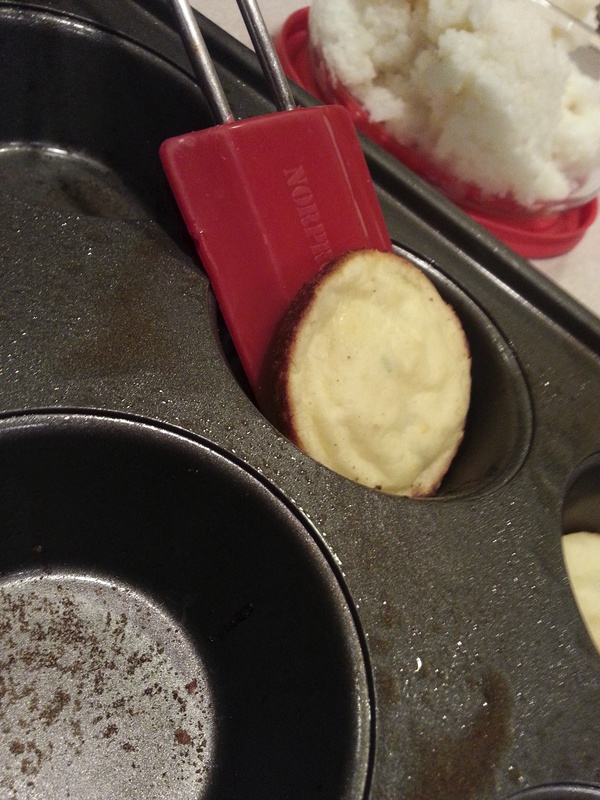 Spoon by the tablespoon into two greased 12 cup muffin pans. Bake at 425 for 12 to 15 minutes or until cakes are golden. Immediately move from pans to wire racks to cool. Makes about 24 cakes. Preheat oven to 400. Spray sheet tray with non-stick cooking spray. Combine dressing, shallots, mustard, water and crushed red pepper in a large bowl. Add mushrooms and stir gently to blend. Let stand 25 minutes. Arrange mushroom mixture on sheet tray, and season with salt and pepper. Bake until mushrooms are golden brown, turning mushrooms over halfway through baking, about 12 minutes. Cool slightly. 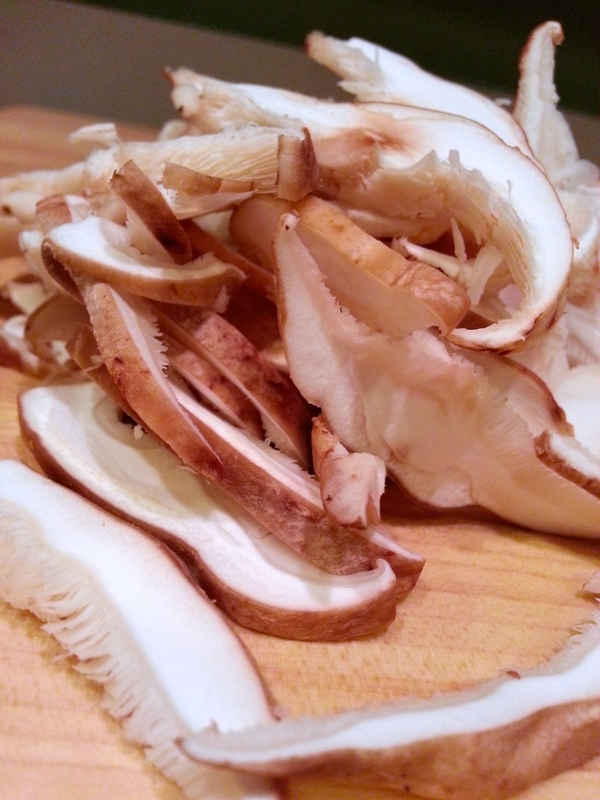 Coarsely chop cooked mushrooms. Add mushrooms to bowl with dressing. 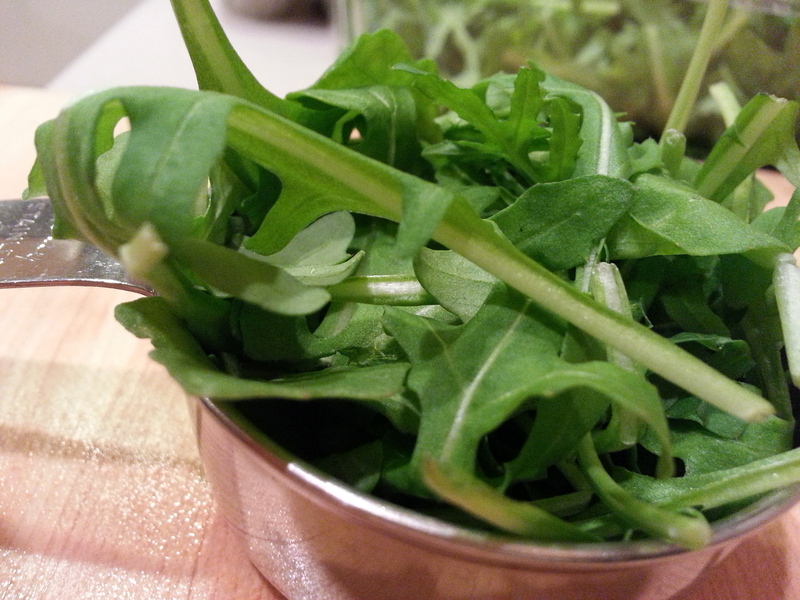 Add arugula and sun-dried tomatoes and toss to coat. Season with salt and pepper if needed. 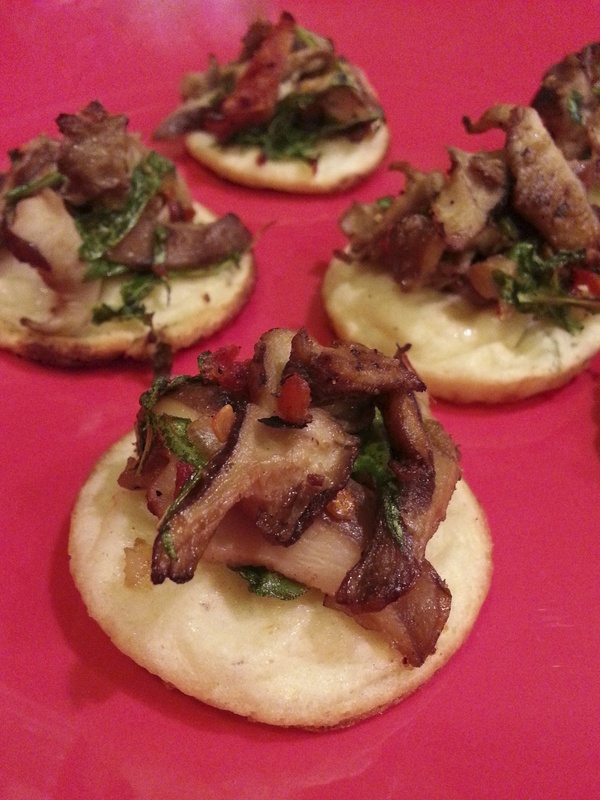 Add mushroom and arugula topping to each grit cake and warm in oven for 3-5 minutes before serving. note: original grit crostini recipe was for 5 dozen so my recipe is halved. I have an old party standby. Ok it isn’t that old. Where the history of this recipe originated from is unknown to me. All I know is that my mom gave it to me years ago, and once I finally made it for some get together, it became a party staple. It’s funny how simple things can be the party glue. 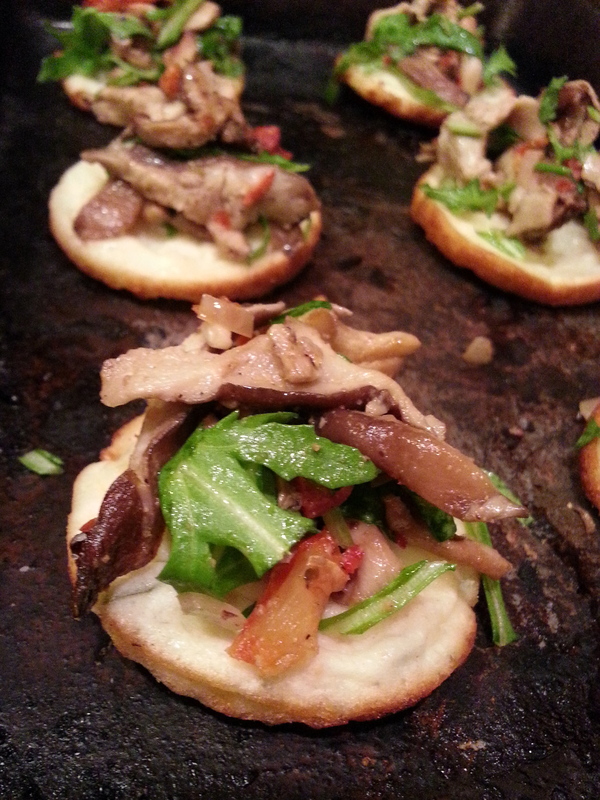 You don’t always have to wow with fancy appetizers or stress about keeping other starters hot in a chafing dish. 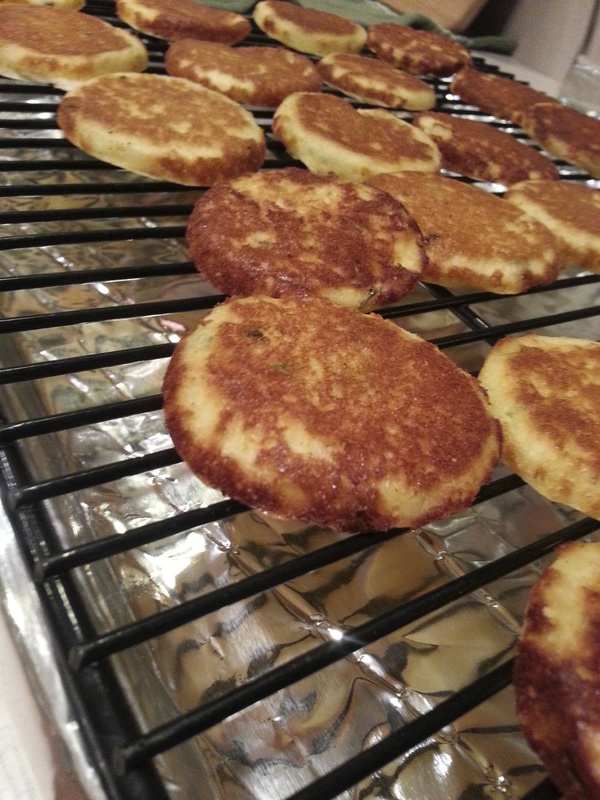 This recipe pleases virtually everyone, and it is super simple to make. I swear by it. Now I know that some may turn a nose up to the bottled italian dressing used here, but I don’t care. I really don’t. Now I do have preference on the type of Italian dressing….but that’s on y’all to decide! 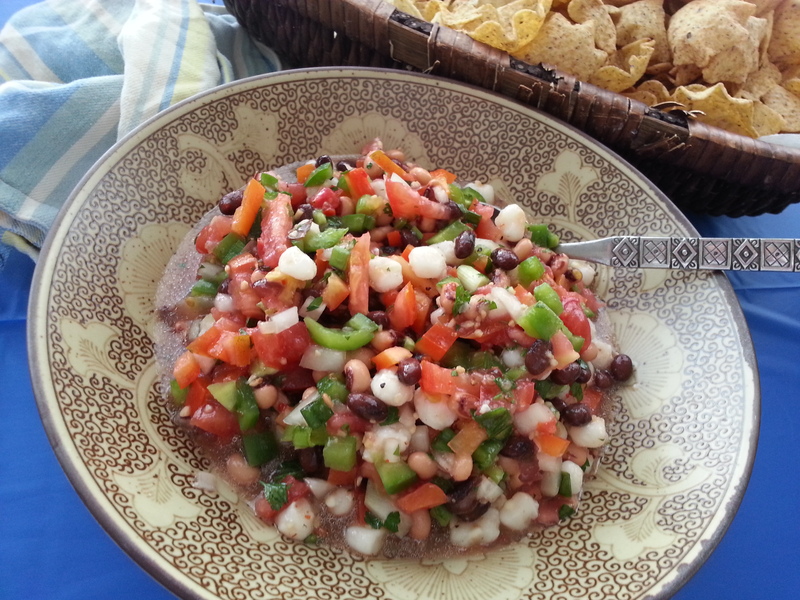 Drain the black-eyed peas, black beans and hominy in a colander and rinse. Add to a large mixing bowl. 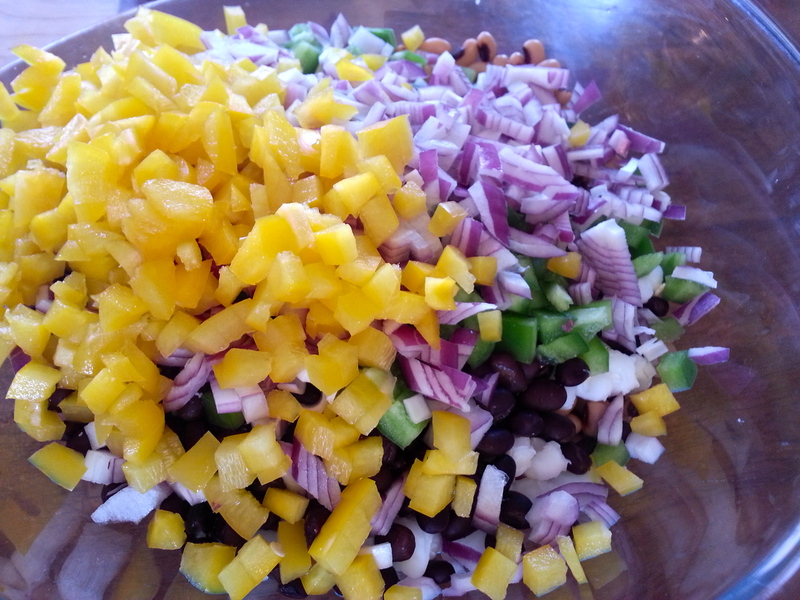 Start dicing the peppers, onions, garlic and tomatoes. 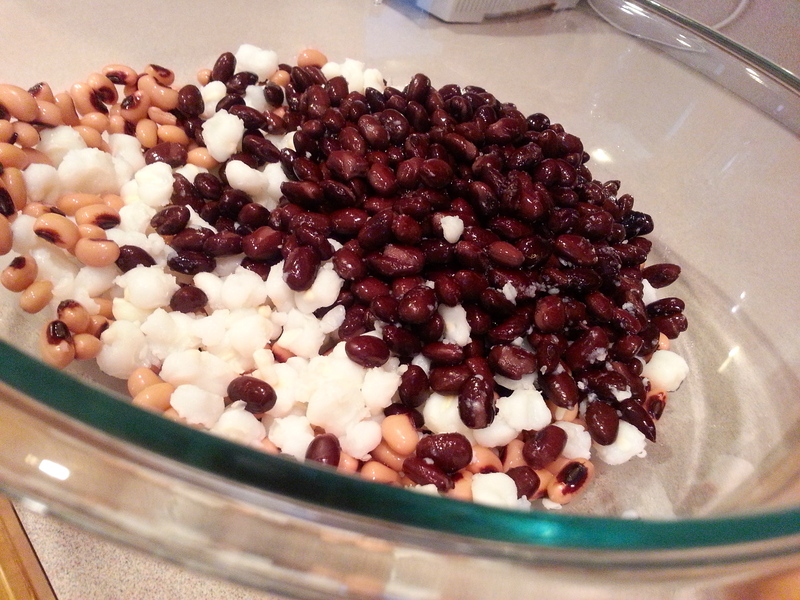 Toss into the mixing bowl and combine with the beans. Add the Italian dressing and parsley. Stir to combine. It is ideal to make this a day in advance and store in an airtight container, but it isn’t required. 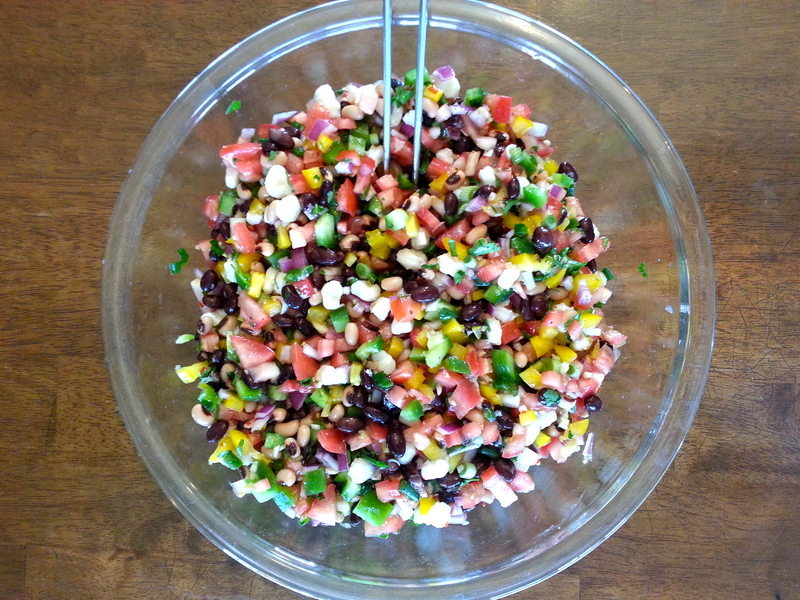 Using a slotted spoon, add caviar to a serving bowl and serve with tortilla chips. note: this serves a crowd of 10-15. 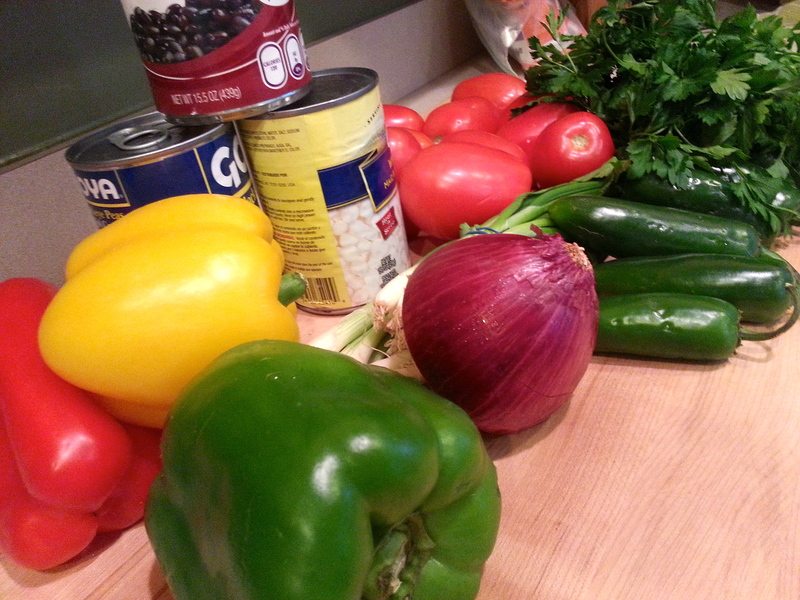 I have added various other ingredients from time to time, like cucumber, olives, mild green chilies…you name it.